Photo by Barbara Confer Franck. If you belong to the SCA you’ve more than likely helped out at one of your local group’s demos at least a time or two or more. What’s unusual is to receive a congratulatory letter from an outside historical nonprofit group wanting to bestow your local group with one of its prestigious awards for doing something you love. This is what happened to the hard-working folk from the Shire of Abhainn Ciach Ghlais (ACG) who recently received an “Historic Preservation Award” from the Shikelimo Chapter Daughters of the American Revolution (DAR). 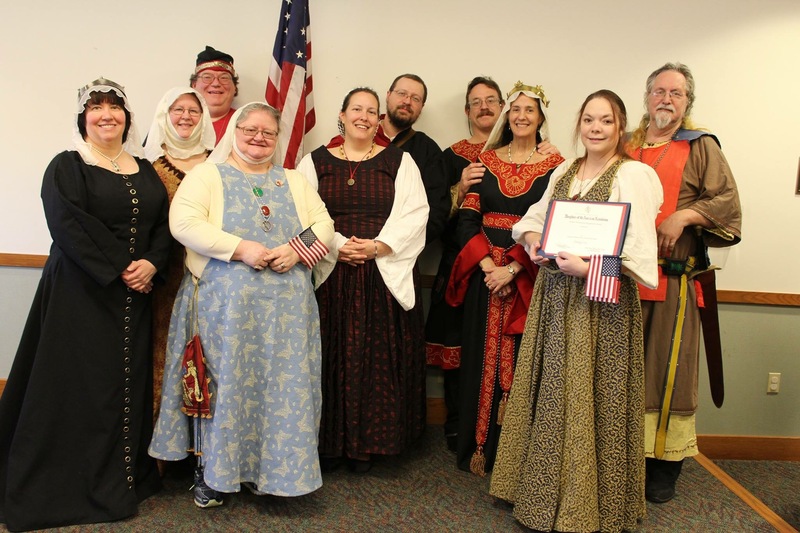 The distinctive honor was bestowed on Saturday, March 26, 2016 during the annual DAR Awards Ceremony held at the Union County Library, Lewisburg, PA. The award is designed to recognize worthy individuals or groups for outstanding achievements in all areas of historic preservation, and was given to ACG for its active involvement, particularly demos, within the local community. During the ceremony, the DAR Regent went into detail about two of ACG’s biggest annual demos, which have been visited by thousands. These include the time-honored medieval encampment held at the Lewisburg Art’s Festival in April and the annual Renaissance Faire and Festival held for the benefit of the Sunbury Redevelopment Initiative. The DAR Regent listed a wide variety of arts and sciences ACG traditionally presents and is enjoyed by the community such as learning how to roll glass beads, creating calligraphy with period tools, weaving chain mail, preparing period camp cooking and more. She also gave credit for the crowd’s fascination with watching day-long fighting and fencing bouts. Smaller demos were also acknowledged such as one held at Camp Victory, a camp for children with diabetes, and what it meant for the children when they had a day of bard-told stories, swinging a sword at a knight in armor, learning how to weave on an inkle loom and playing medieval games. The Regent even mentioned how much enjoyment DAR members had when last year ACG performed a demo for them. Attending shire members were asked to come up on stage to accept the award. These included Duke Sir Timothy of Arindale and Duchess Gabrielle van Nijenrode, Dame Bronwyn MacFhionghuin, THL Brad Boda Aetheward, Lord Conrad Keinst, Lady Byrgida Zajaczkowa, Lady Elyes la Bref, Lord Jeremiah MacCoul, Lady Greer Wallace, and Lady Deirdre Kildare. Refreshments, along with picture taking, followed the bestowal of awards. Since the DAR’s founding in 1890, historic preservation and education have been part of its mission. Its Historic Preservation Award is an annual honor given to one individual and to one group. The would-be recipient must be nominated with supporting documentation such as newspaper articles and recommendation letters which are then forwarded to the Historic Preservation Committee of the National Society for approval.